Chermoula is a marinade hailing from Northern Africa, typically used to bring flavor to meat or seafood dishes. It has a smokey, citrus-y taste. 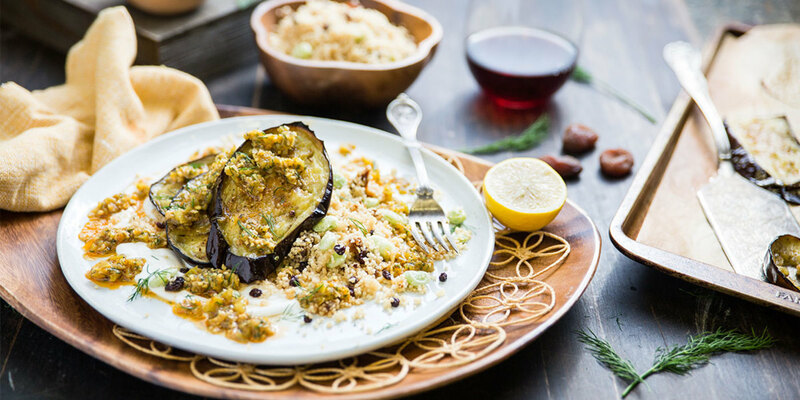 Here, we use it to complement the roasted texture of the eggplant and sweetness of apricot couscous. Rinse and dry all produce. Preheat the oven to 425°F. Cut the eggplant into rounds on the diagonal. Deseed the cubanelle pepper and roughly chop. Add ¾ cup water to a small saucepan and bring to a boil. Add the whole wheat couscous, cover, and remove from heat. Let couscous stand until Step 5. Transfer eggplant to a baking sheet and coat with 4 tbsp olive oil. Season generously with salt and pepper and place in the oven. Roast until eggplant is browned on the bottom and soft, about 30 to 35 minutes. Place a medium skillet over medium-high heat with 1 tsp vegetable oil. Once hot, add the chopped cubanelle to the skillet. Cook, turning occasionally, until charred and softened, about 5 to 7 minutes. Remove from the heat to cool. Peel and grate the ginger. Grate 1 clove garlic into a medium bowl and add the ginger. Chop the dill fronds and add to the bowl. Zest the lemon and add just 1 tsp lemon zest to the bowl. Add the smoked paprika, cumin, ¼ tsp salt, 2 tbsp olive oil, and the juice from half the lemon. Finely chop the charred cubanelle pepper, add to the bowl and stir to combine. Finely chop the dried apricots. Fluff the cooked couscous with a fork and add the apricots, currants, lima beans, remaining lemon zest and juice, and a pinch of salt. Stir to combine. Spread the vegan yogurt on the bottom of large plates. Top with apricot couscous, roasted eggplant, and cubanelle chermoula. Enjoy!